This Mickey Santa and sleigh Christmas tree skirt has a continuous light effect. Connect to Hallmark's Magic Cord to see snowflakes and Pluto's nose light up! 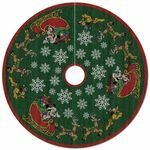 You've never seen a tree skirt like this before! Starring Mickey Mouse as Santa and Pluto as a reindeer, this magical skirt has light-up snowflakes and an illuminated nose on Pluto, all with a little help from Hallmark's Magic Cord (sold separately). Learn more about Keepsake Ornaments.